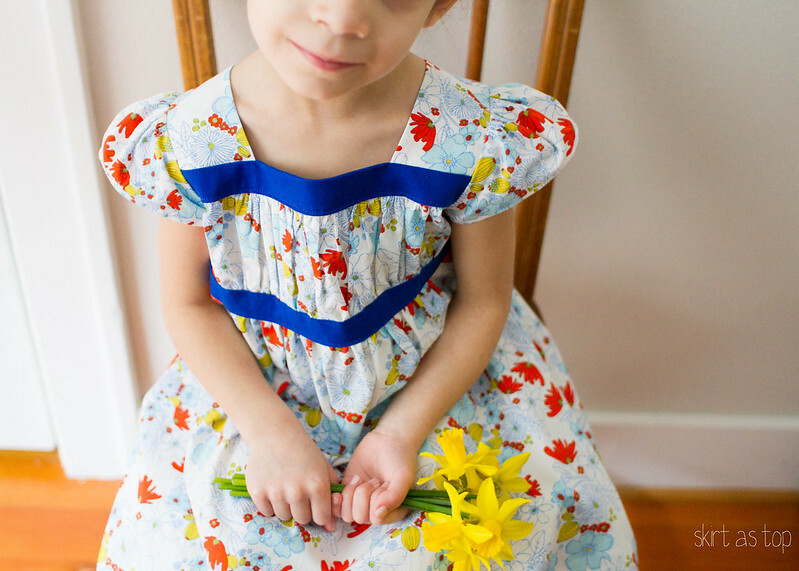 the spring Oliver + S patterns are here! hooray! there are three new patterns and they’re all pretty darn cute, as you can see in their announcement post. 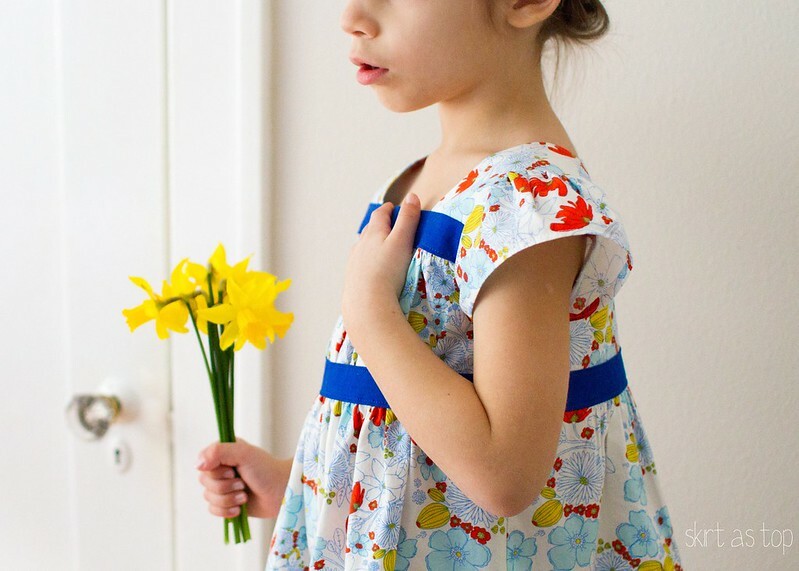 i was actually a pattern tester for the Lullaby Layette and i’ll post about that later, but the Garden Party Dress (available on paper or digitally) is the one that really stood out to me as being perfect for Em as soon as i saw it. her version of a princess is apparently quite solemn, though she hammed up a few crazy zombie faces too at the end, haha. and yeah, we have daffodils blooming in our yard. i’m sorry to those of you still buried in snow! spring is coming, we promise. about the Garden Party Dress! it’s got a lovely gathered bodice that, to me, looked like more work to construct than it actually was – there’s quite a bit of basting and gathering, but it still came together surprisingly fast. 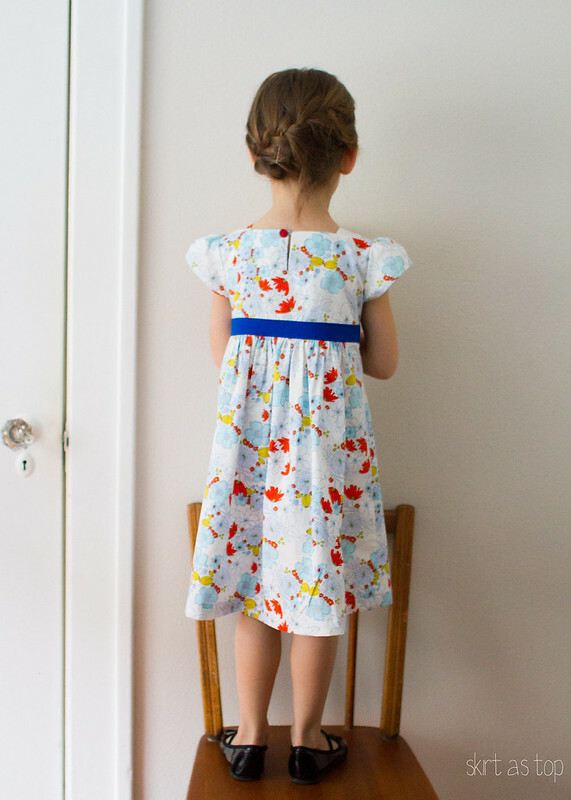 i made View A (dress with cap sleeves) in a size 4 and added 1.5” to the hem length because she’s still a beanpole. i’m glad i added the length – it hits her just below the knee and should last her through the summer (hopefully maybe). the pattern calls for 1.75 yards of fabric but i think i made it in 1.5 yards or less…so if you have a perfect yard and a half in your stash, you could probably make it work with careful cutting. that’s what i’m hoping anyway, because i have quite a few cuts that size! the neckline facing and simple single button keyhole closure in the back lead to a quick, clean finish. Em chose the red button. i made an aqua thread chain out of embroidery floss (Oliver + S has a tutorial here – i just made a loop and then tied square knots around the loop string until it was reinforced into a sort of twisty friendship bracelet from my childhood type deal). the design gives you a chance to play with fabric choice and really change the look of the dress, which is always fun. here i wanted to really play up the garden party theme and make it in a modern floral, so i chose a print from Leah Duncan’s gorgeous new line for Art Gallery Fabrics, Meadow. 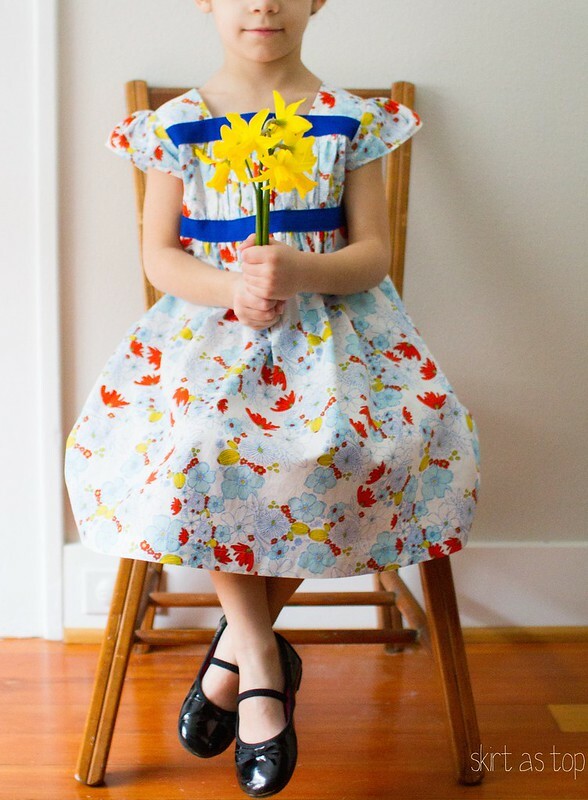 i love every print in the Meadow line (and everything Leah Duncan does, really), but this simple line drawing floral stood out and seemed so sweet for spring. it’s called “Lea’s Bloom in Clearwater” and i got it at Bolt, you can find it here online. i paired it with a royal blue kona cotton for the trim. it’s always a risk picking blue for Em, but she approved and called it beautiful, so we were good to go. it felt great to sew a dress for Em, and dresses with sleeves are a must for her school dress code, so this is a practical addition to her wardrobe. 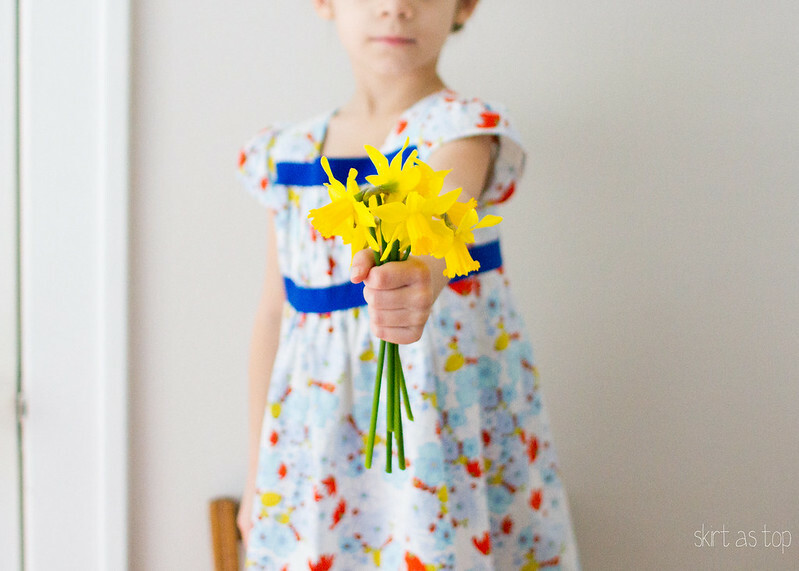 head over to probably actually to check out Gail’s beautiful version of this dress (in another Meadow print, coincidentally! ), and over to you & mie to see Cherie’s adorable layette jacket (fantastically modern fabric combo!). and if you’re still not convinced, you can find more details on this and the other new Oliver + S patterns right here. p.s. i was given a copy of the garden party dress with no strings attached; my opinions are my own. How pretty and the fabric is very garden party! It’s such a sweet dress! I love the look if the gathered bodice! Oh this dress is beautiful!! 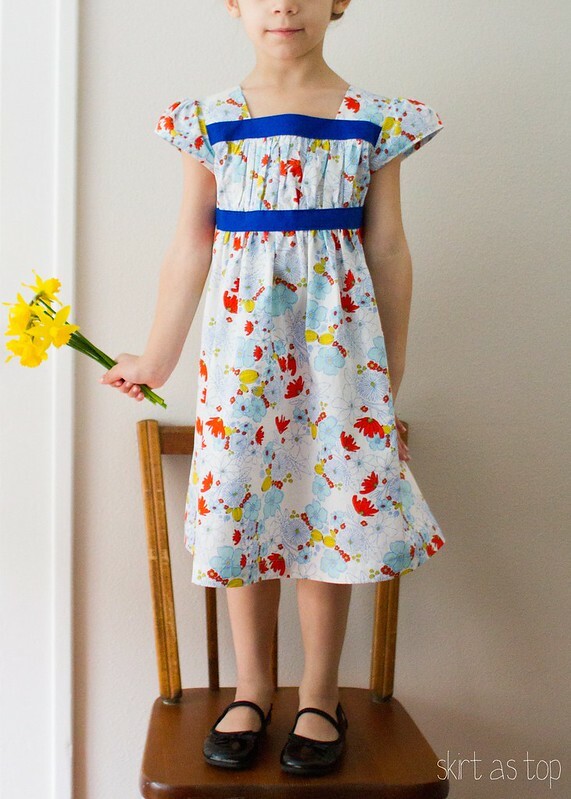 I am in love with pretty much all of Leah Duncan’s fabrics and have been drooling over her new line! 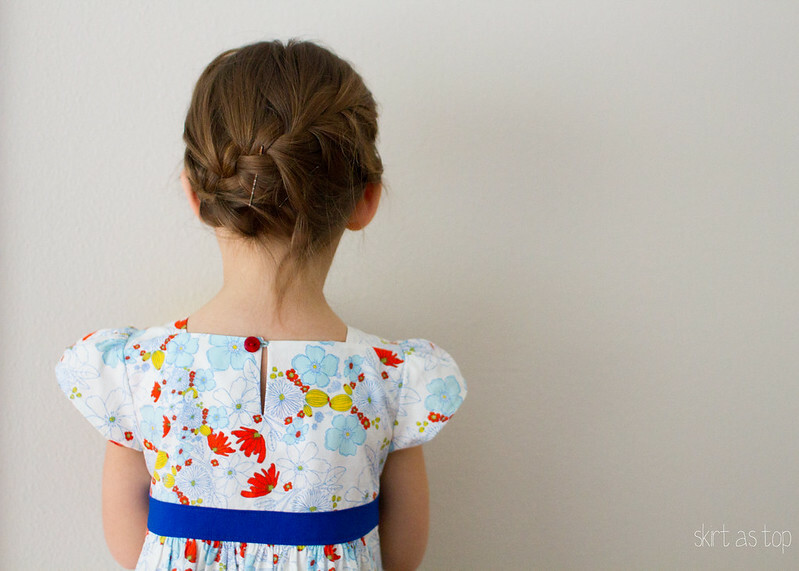 And, after seeing the new Oliver + S patterns yesterday I immediately fell in love with this one, that gathering is just too cute! Beautiful dress, so sweet. I love your fabric choices (how could I not? Leah Duncan print and the most gorgeous blue trim) and I reckon this would be the perfect pattern to use all the bits of fabric (leftovers) that I’ve been collecting! This is so so darling. I love the contrasting colors and lovely sleeves! this is amazing, kristin! and i love the photos so much! they made me laugh! that hand over her heart! hahaha! the bodice does look complicated. i was studying it and wondering, “how did she do that? 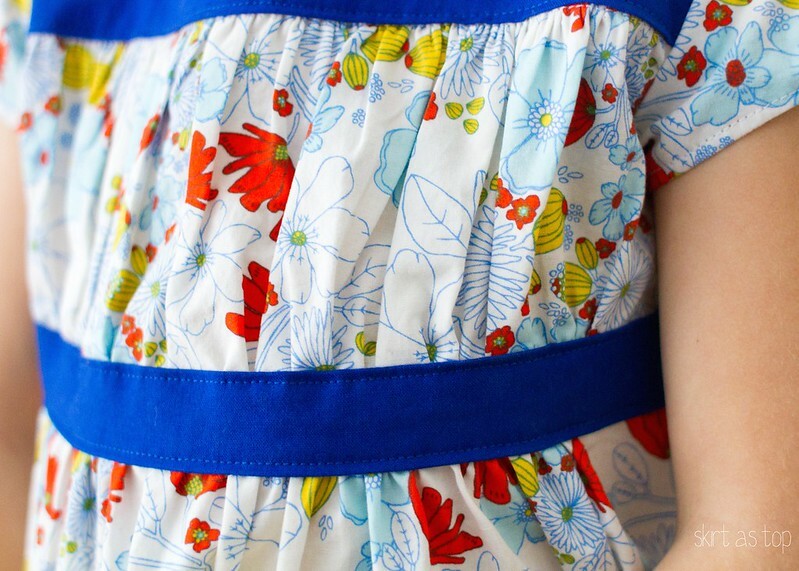 it looks like pleating, but not quite.” i love this fabric, too. and her hair! did you do that, too? indigo would be in heaven! Sooo pretty! Love it and I’m glad E does too. Definitely shouts SPRING! What a regal princess she makes . . .
very sweet. except i am mad about your daffodils:) nice hairdo too, mama! i’m totally amazed that you are doing all of this with the new one in tow. thanks for the inspiration! Love it! That fabric is perfect. Beautiful, just perfect in that fabric. So pretty! And definitely very spring like. That fabric is gorgeous! 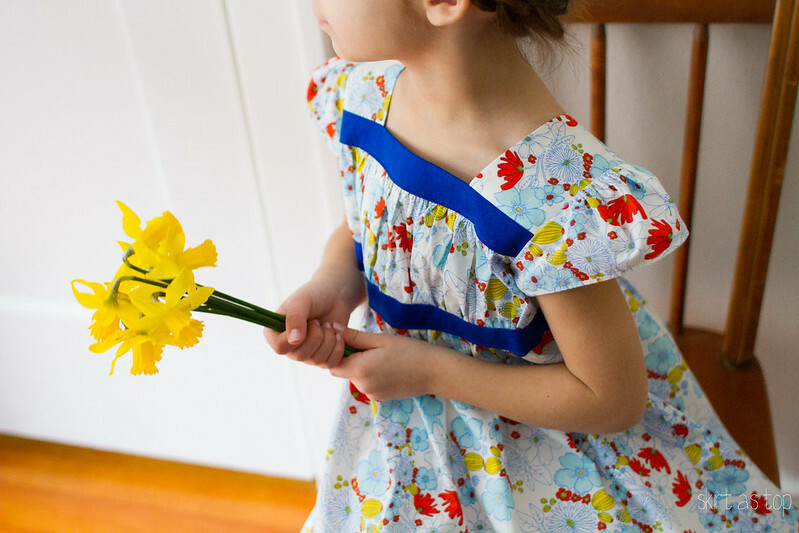 what a perfect dress for your sweet princess! awwwww It turned out so cute! The colors are so bright and happy, but not loud. Aww this is so pretty. She’s getting so big waaaah! And how unfair is it that you have daffodils over there. We have -2 forecast for tonight. In. Sane. I hope you are getting some rest. Love this dress. You’ve made a great advertisement for the pattern with this one and Em’s princess acting is priceless. oh well this is just so lovely! I love the colors, and the royal blue for the contrast was a great choice. A perfect princess dress! Oh so Spring-y… and just beautiful! this is so pretty! Can’t wait to try one of the new Oliver and S patterns out. Spring!